Creamy, buttery, rich taste, deliciously soft and chewy. They melt in your mouth and taste incredible - so much better Homemade Salted Caramels take some time, but result in a perfect candy and are great for gifts! In at least a 2 quart microwave safe dish glass dish, melt the butter (took about 1 1/2 minutes in my microwave). When butter is melted, add the rest of the ingredients. Microwave on high for 2 minutes and then stir. The mixture will be nice and foamy. Microwave another 2 minutes and stir it again. This is SO hot, so be careful when removing from the microwave to stir. If you want really soft caramels, you could just remove them now and let them set, but I will let you know they are VERY soft and runny even when they set up. I recommend microwaving 2 minutes, stirring and then maybe even another 1-2 minutes and stir. In a large pot over medium heat, add the butter, both sugars and corn syrup. I don't recommend using a non-stick pan, because for some reason they just don't seem to get the ingredients to the caliber they need to be by the end. Stir over medium heat until mixture begins to boil, about 5-10 minutes. Stir often. Like almost continuously. You want to be careful not to burn the mixture at all. Add the sweetened condensed milk a little at a time while stirring constantly. You're making sure the mixture stays a constant boil so the caramels don't curdle with the added milk. Stir the mixture constantly, you don't want to stop and sometimes having someone else around to help makes a huge difference. Trust me your arm will get tired. Be sure and scrape the sides occasionally until it reaches firm ball stage (about 240 degrees F on a candy thermometer). You should also try it the old fashioned way - simply drop a spoonful of hot caramel sauce into a cup of ice water and then mold it with your fingers into a ball. It should roll nicely but also be firm and set up. That's how you know you have the correct stage. One your caramel hits the firm ball stage (240 degrees F), remove from heat. Stir in a vanilla if desired. When you've cooked it long enough, pour the caramel into a buttered pan (we use a jelly roll pan) (or use parchment paper to line the pan which makes clean up a breeze) and let it set up. If you want to speed up the setting, you can put them in the fridge for a couple of hours. I did it for about 2 hours total. If you want to sprinkle your caramels with sea salt or course salt, do this before they set. You can also use crushed nuts, sprinkles or whatever you like. I used a pink sea salt, and also a rose flavored sea salt I've been saving. When it's set, use a pizza cutter or a sharp knife and slice the pieces the size that you want. 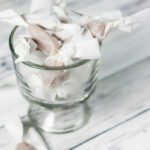 Once you have them cut to the size you want, cut up pieces of parchment paper, roll up the caramels into the parchment paper, twist the ends and you're ready to go. They make a great gift!